Red chillies : 3 to 4 nos. 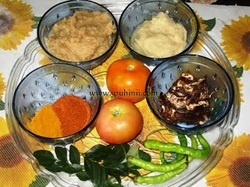 Clean mutton, add 1 table spoon ginger garlic paste, chiili powder, haldi and 1 tea spoon of oil. Mix well add a cup of water and cook in a pressure cooker for 6 to 8 whistles and keep it aside. Soak tamarind in warm water for 10 to 15 mins. and make thick pulp. 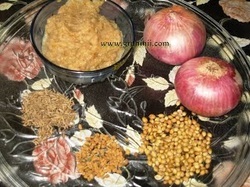 Grind 2 Onions, jeera, methi and dhaniya (whole) into fine paste. Heat 2 table spoons of oil in a thick bottomed vessel, add jeera to it. Let it splutter. Add Red chillies, green chillies, Mashed garlic pods and curry leaves. Cook for few seconds and add onion paste. Fry until it turns pink and starts leaving oil. Now add half tea spoon of haldi to it and add the cooked mutton to it. Stir well and add chopped tomatoes. Cook for few min. till the tomatoes are cooked. Now add the tamarind pulp and salt to it. Cook in a low flame for 10 to 15mins. and take it into a serving bowl. Garnish with fresh coriander leaves. Hot,spicy and sour Mutton pulusu is ready.......... Serve hot with Rotis, Chapatis or rice.